GlaxoSmithKline CEO Andrew Witty said a bribery investigation would hit the company's business in China, where sales grew 14% in the second quarter. The corruption scandal sweeping through China's healthcare sector will dent GlaxoSmithKline's rapidly-growing business in the country, the company said Wednesday. GSK (GSK) admitted this week that some of its executives may have broken the law, and promised to change its business practices, after Chinese police accused the company of facilitating a bribery ring to artificially boost drug prices. The British drugmaker is accused of channeling nearly $500 million through a network of 700 travel agencies to pay bribes to government officials, medical associations, hospitals and doctors. "Clearly, we are likely to see some impact to our performance in China as a result of the current investigation, but it is too early to quantify the extent of this," GSK CEO Andrew Witty said in a statement. 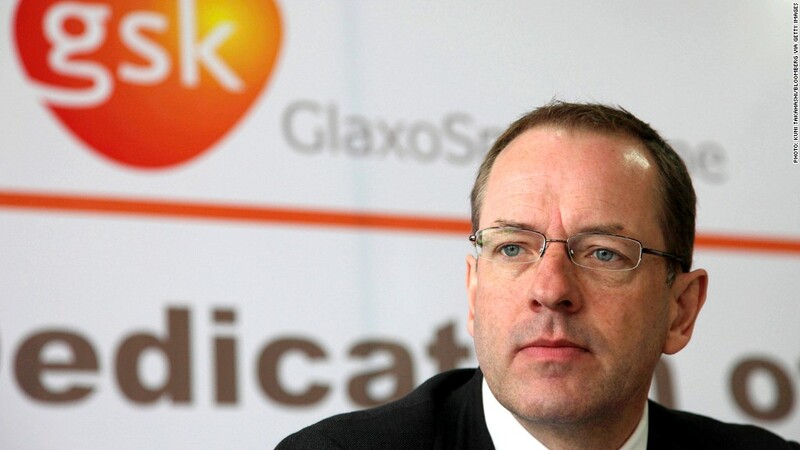 Four senior GSK executives have been detained. State television has aired an apparent confession by one of the four, Liang Hong, explaining how the scheme worked, including the use of fake conferences and travel agencies to create receipts for services that were never performed. The surplus funds were allegedly then used to pay bribes. In addition, Steve Nechelput, finance director for GSK China, has been prevented from traveling outside the country since the end of June. Chinese police accused 39 hospital workers of taking more than $450,000 in kickbacks from pharmaceutical firms over a three-year period, state media reported Wednesday. Nine of the doctors involved had been suspended or had their licenses revoked, and a case involving a trade union official was referred to the judicial system. China appears determined to clean up its healthcare sector. It is investigating price-setting practices at 60 pharmaceutical companies and lawyers believe firms other than GSK may be caught up in the anti-corruption drive. Two managers working for a second British drugs firm, AstraZeneca (AZN), have been questioned by police after a local sales representative was detained last week. The firm said it saw no link to the GSK investigation. Witty said he believed the probe was focused on individual GSK senior managers in China who had set out to defraud the company and the healthcare system, and he saw no link with an ongoing industry-wide probe by U.S. authorities into potential corrupt practices in foreign countries. "As far as we're aware, the China situation is a China situation. And the investigation is a domestic investigation," he said on a call with analysts. Big pharmaceuticals companies have rushed to invest in China in recent years to take advantage of rapid growth for medical treatments, but they're now under enormous pressure to reduce costs as the population ages, straining the country's medical system and care facilities. GSK's sales of pharmaceuticals and vaccines in emerging markets grew by 2% in the second quarter, double the rate for the division as a whole. Revenue from China spiked 14% to £212 million ($18 million). Emerging markets account for about 23% of revenue in the division. Witty said China appears to have reached "an inflection point" in its bid to modernize healthcare. He added that GSK has commissioned an independent review to establish what went wrong, and continues to see China as a key investment location.